KISSsoft AG, a developer design software for engineers and designers in a wide variety of fields, has released an update (SP5) to KISSsoft 03/2017, a modular calculation system for the design, optimization and analysis of machine elements. The face gear system with axial offset and helix angle was not positioned correctly. The maximum number of teeth of the pinion cutter was limited to that of the corresponding gear in the 2D graphics. In some gears with high helix angle (crossed helical gears, cylindrical gears), the tip form diameter was not calculated correctly. This is now fixed, additional message is displayed in the report. If you set an UNC-path as UDBDIR in the kiss.ini, the idx-files (index) were written in the wrong folder. That means for hidden set data entries or own defined data entries the order was wrong in the database. In some Portuguese KISSsoft surfaces were Chinese texts. The amount of tooth bending of internal gears was not calculated correctly. This affected also the singular tooth stiffness reported from the FEM root stress calculation. The information on the gear that was selected to be analyzed was not passed correctly to the calculation, for the cases of 3- and 4-gear chains and planetary systems. The calculation was not always set to inconsistent when changing the data of an element in the element editor or changing the position of an element by mouse move. About KISSsoft Software. 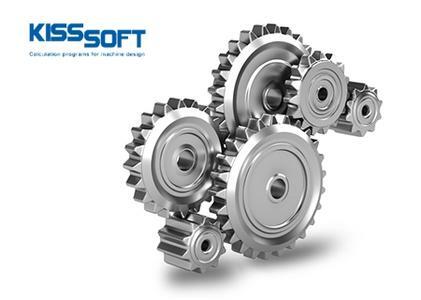 The KISSsoft calculation programs offer a comprehensive suite of powerful calculations to size, optimize and rate machine elements such as gears, shafts, bearings, bolts, splines, keys, interference fit, springs and others. All calculations are based on international standards to provide the user the necessary reliability. An intuitive user interface and context sensitive online help are the key to fast and efficient use of the program. Extensive reports offer in-depth understanding of the results. Due to the five supported languages, KISSsoft can be used in an international environment. With the KISSsys program, complete gearboxes can be analysed on a system level. About KISSsoft AG. KISSsoft AG develops design software for engineers and designers in a wide variety of fields: whether they manufacture cable car systems, gears for construction equipment, Formula 1 race car transmissions or the tiny gears used in Mars rovers, more and more companies all over the world have come to rely on KISSsoft design software. When used in keeping with currently valid standards (DIN, ISO, AGMA), our software serves as a quick, high-quality tool for sizing machine elements, reviewing calculations, determining component strength, and documenting safety factors and product life parameters. KISSsoft 03/2017E (SP5) Update 190318 rapidshare mediafire megaupload hotfile download, KISSsoft 03/2017E (SP5) Update 190318 torrent emule download, KISSsoft 03/2017E (SP5) Update 190318 full free download, KISSsoft 03/2017E (SP5) Update 190318 rar zip password or anything related.